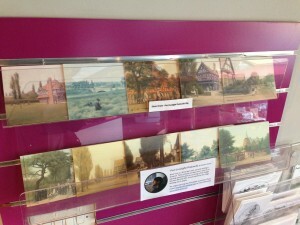 Postcards of my Port Sunlight paintings are now available in the gift shop at Port Sunlight Museum! There are 10 to choose from, priced at a very reasonable 85p. Port Sunlight Museum is situated at the heart of Port Sunlight Village, a stones throw from the world famous Lady Lever Art Gallery. This entry was posted in Port Sunlight and tagged Port Sunlight, Postcards, Wirral on September 16, 2014 by Stuart_d_Irwin82.